The Value Proposition Canvas and the Value Proposition Canvas are great tools to be used in the design thinking process. They allow you to play ‘what-if’ games, basically prototype solutions as a means to helping you in understanding the wickedness of your problem. 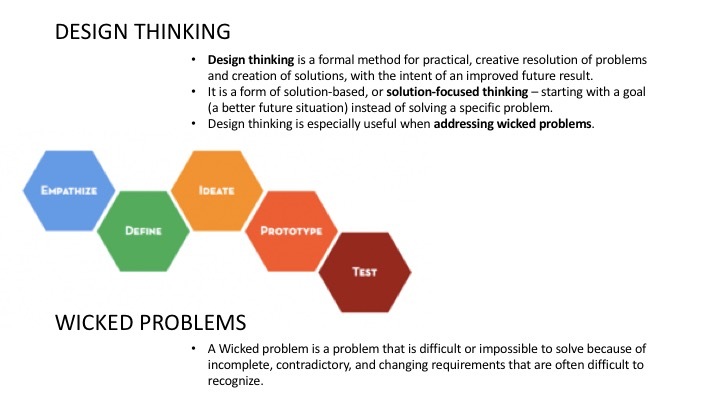 Design thinking as methodology emerged in response to so-called wicked problems, problems which are to complex with interconnected influencing factors making that there are no immediate solutions. The image illustrates a problem and a wicked problem. A problem as clear constraints for which we have well developed methods to resolve. For example, we know how to build a bridge that lasts time and load crossing it. Well defined constraints to which we have a clear yes/no or good/bad answer. A wicked problem is too complex to have a simple good/bad or yes/no answer. Where to build a bridge, or how the bridge should look, even what colour it should have, theses are problems where there is no clear good/bad answer. It all depends, and you have to work with those who have to live with the bridge to find an acceptable answer. 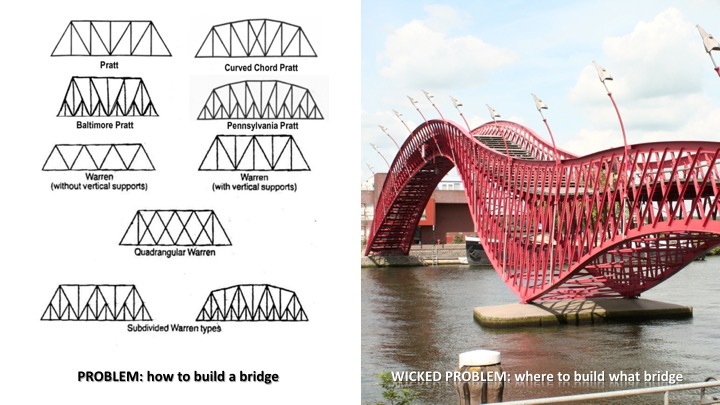 And this is a simple wicked problems. It gets more complex when dealing with cloud based solutions, big data and internet of things. Way more complex. Core to solving wicked problems, which is also core to design thinking, is playing what-if games trying to understand the problem. Design thinking goes through a process of ‘understanding’ the user’s needs (empathy), followed by defining and ideation resulting in prototyping (MVP) and testing. This is not an end-point, but part of an ongoing process to build, test, learn and build again. In this process of trying to answer ‘what-if’ questions allowing you to increasingly understand the wickedness of the problem and define what works best to resolve it. 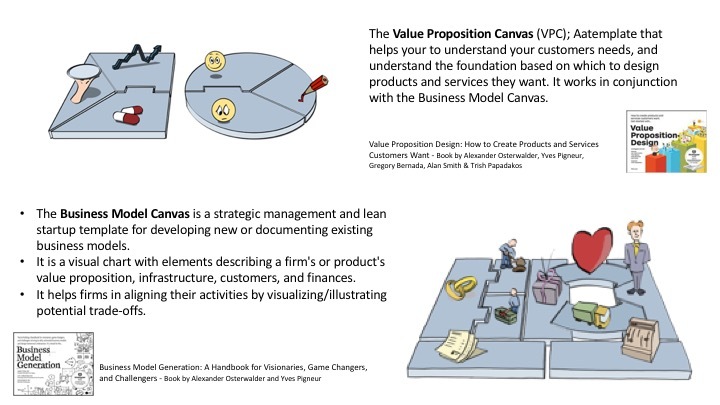 Both the Value Proposition Canvas and the Value Proposition Canvas are tools that help you you through the design thinking process, that allow you to play ‘what-if’ games with your problem. What if the bridge colour is the most important pain factor? What if the maintenance of the bridge is outsourced? What if it becomes a toll bridge? Where is the real value add? What if, what if. Both tools are great for playing this mind games that help to better understand the problem, and creates the basis to define the most effective test or prototype moving forward. How are you using these tools in the design thinking process?